There is a leak (and getting worst) where water is coming up the stem on the main water valve (angled globe valve I think). I know I may be able to fix this by tightening the gland nut, but I cant find the gland nut! I have attached the photo, can anyone help? The alternative is to get the water authorities to come out and close the value which is somewhere on the street. They'll charge $120 for doing this and wont let me do it. I then would need to have a plumber present at the same time, to replace the value and then have the water people turn the water back on. The total cost will probably be several hundred dollars. Ouch. The leak is not increasing my water bill since it is before the meter, so I have kind of not been paying attention. Your help is very much appropriated. Tightening the packing nut (the large nut that is visible with six facets) would be the only option I know of. This valve is the water company's responsibility where I live. I assume you've inquired. Hope this helps. If the water is leaking on the home owners side of the water meter in most municipalities it is the owners responsibility to make or pay for any repairs. The repair is straight forward and simple. If you won't be violating any ordinances you could turn the water off yourself. To shut the water flow off at the street you will need to look for the valve. Usually located just in front of the house near the curb or before the street. To help narrow your search water companies will mark the location/direction of the valve on the street surface. Look for a painted blue insignia. It will look something like a circle with an arrow pointing towards the valve location. It is probably in a sunken concrete pit. To repair the leaking Gate valve with or without the water being turned off start by closing it half way. Using adjustable pliers (channel locks), pipe wrench or adjustable (cresent) wrench turn the bonnet/ packing nut clockwise slowly, but firmly. Apply only enough mild force to turn the nut. Open the valve and check for leaks. If it still leaks shut the valve off completely and repeat the tightening sequence. If the leak doesn't stop the bonnet washer inside is worn and needs replacing. Rather than replace the valve with a similar type Gate valve which are more prone to breaking and parts wearing out consider installing a "ball" type valve which are designed with fewer parts that wear out and are easier to use. Not the answer you're looking for? Browse other questions tagged water leak valve or ask your own question. 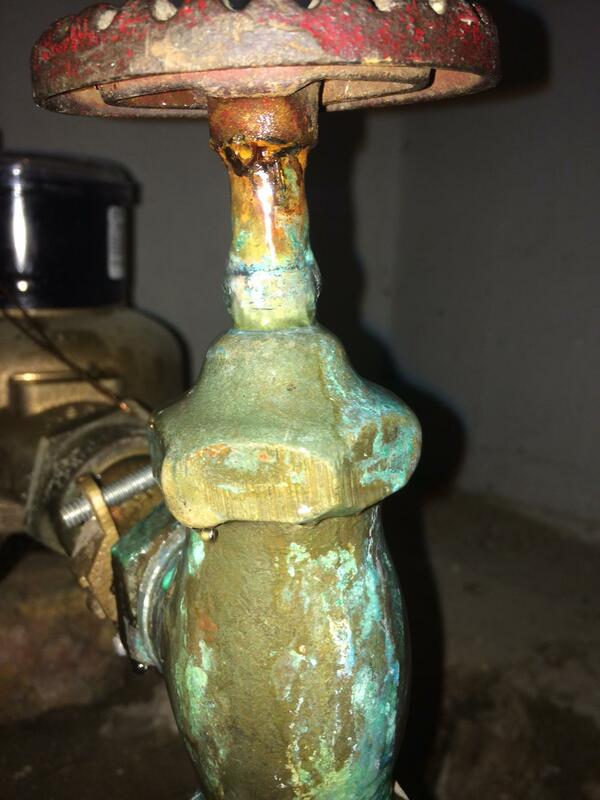 How can I replace my main water shutoff valve? Is it acceptable to not have access to the main water shutoff valve? How to fix a threaded toilet shutoff valve?